Happy Friday, loves! Before I jump into talking about cake and giveaways, I want to make a quick little mention. 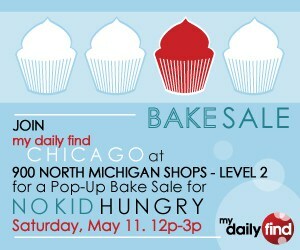 Tomorrow – that would be Saturday, May 11, 2013 – I am joining My Daily Find Chicago and some of Chicago’s best bloggers, writers, and foodies for the 4th Annual Chicago Pop-Up Bake Sale benefitting No Kid Hungry. We will be at 900 North Michigan Shops, Level 2, from noon-3 pm with a number of gorgeous, homemade treats to help eliminate childhood hunger in the United States. If you are in the city tomorrow or would like to take a day to explore downtown, make sure to stop by and say hi! I’d love to meet you and sell you a cupcake or two. Since this week has been all about Mother’s Day desserts, let’s talk about moms for a minute, shall we? Did you know that this year, Mother’s Day and World Fair Trade Day fall on the same weekend? 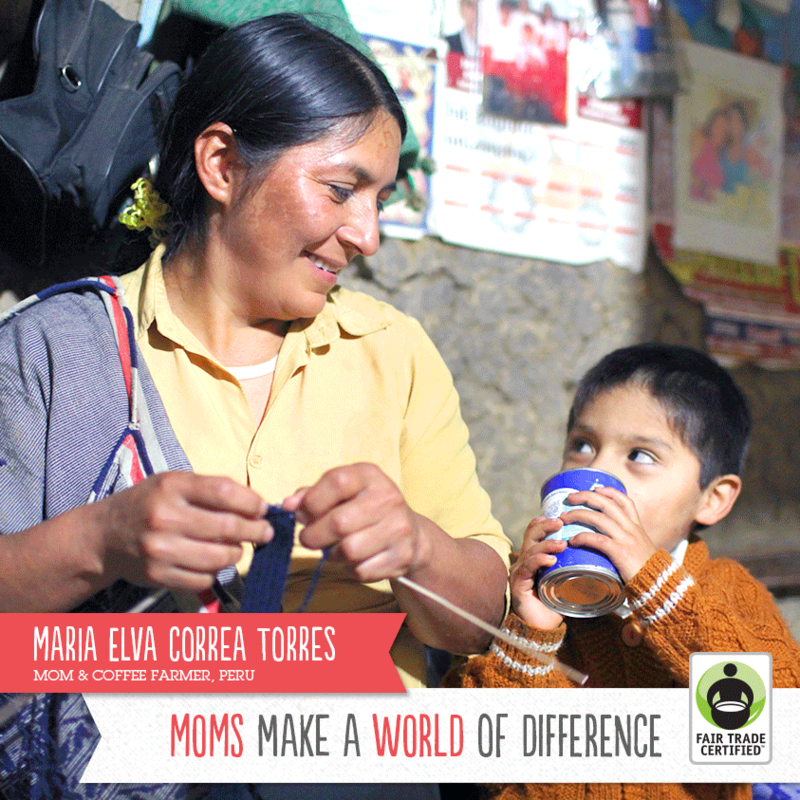 To celebrate, Fair Trade USA is highlighting stories of moms around the world – just like Maria, pictured above – who, because of fair trade cooperatives, are better able to provide for their families and see their dreams realized. “Fair trade” means just that: Products that bear the Fair Trade USA logo come from farmers and workers who are being justly compensated. The impact goes beyond just the workers and their families, though: With the help of fair trade cooperatives, farmers in developing countries are able to build sustainable businesses that positively impact and influence their communities. Workers are taught how to use their skills and the free market to their advantage to make a positive change in their day-to-day lives. This is especially important in communities where women might not otherwise be encouraged to contribute economically – allowing them to earn a place of respect and power in their families, and drastically reducing rates of domestic violence. Every time you purchase a product with the Fair Trade USA logo, you are helping someone like Maria see her dreams of starting a small grocery business at the Sunday market and sending her four children to college come true. To read about more fair trade moms, check out the Fair Trade USA Mother’s Day feature. I bet some of you have already tried Green Mountain Coffee, Numi Tea, LARABAR, or Alter Eco products – well, they are all fair trade! This means that supporting fair trade cooperatives and positively influencing communities around the world is as easy as brewing your morning coffee or afternoon cup of tea. 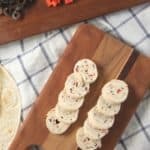 Fair Trade USA recently sent me some of their favorite products to check out, and I will tell you – these products are awesome! Believe me, making the switch to regularly purchasing these fair trade products would not be a sacrifice at all. To enter, comment below and answer the following question: What makes your favorite woman (mom, grandma, aunt, sister, friend, etc) in your life special? Giveaway is closed! Contest closes at 10 pm CST on Thursday, May 16. Winner will be notified via email and will have 48 hours to respond before a new winner is chosen. The winner was comment #5: Stephanie from Girl vs. Dough! Congrats, Stephanie! I recently made this coconut cake to celebrate my cousin’s senior art show. 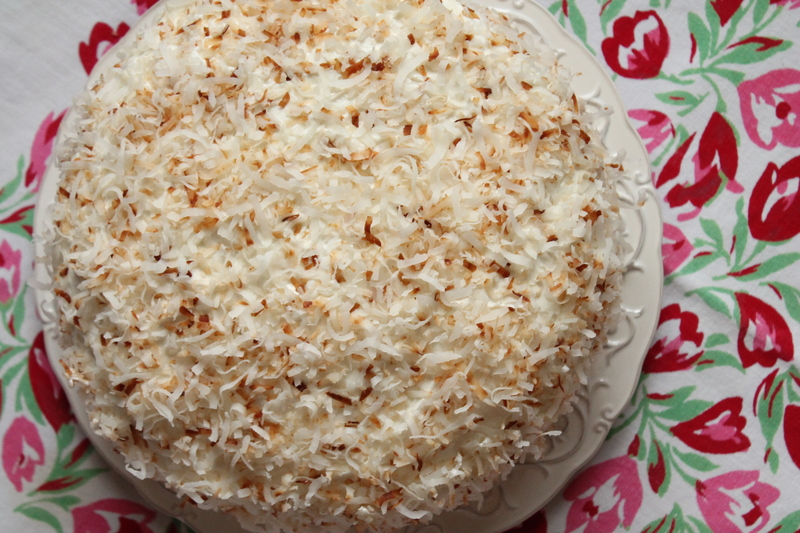 My family looooooves coconut, so I knew this cake would be a total hit – and I was right! Here is what a coconut cake is NOT: a coconut cake is not a plain old white cake with some coconut stuck to the outside. Nonono. To me, a coconut cake needs to have elements of coconut running throughout the cake, and that’s exactly what we have here. 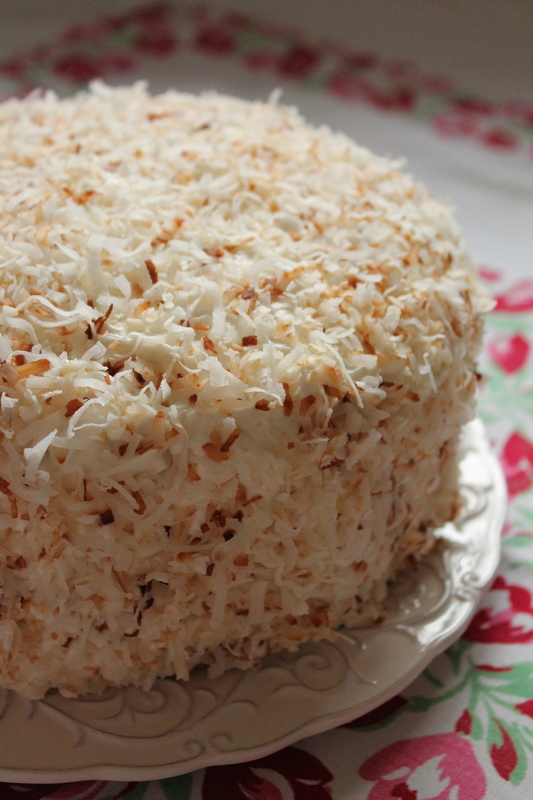 A perfectly moist cake flavored lightly with coconut milk, layered with a coconut filling, covered in buttercream made with a splash of coconut milk, and topped with toasted shredded coconut. 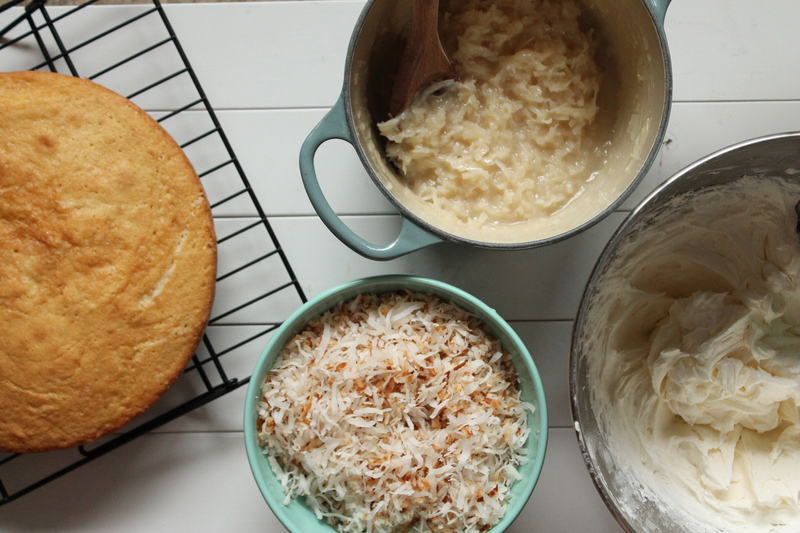 That, my friends, is a coconut cake, and one that your mom will love this Mother’s Day. 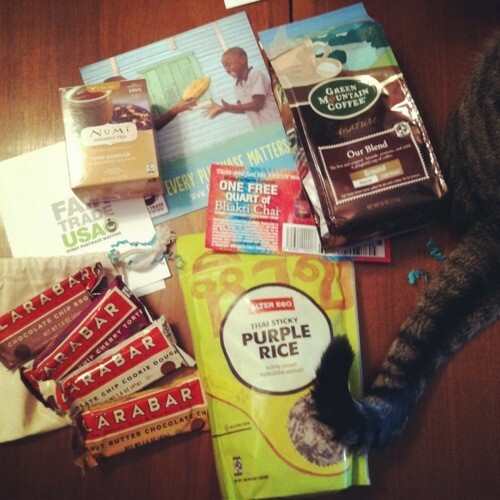 Fair Trade USA provided products for review. I was under no obligation to host a giveaway and, as always, all opinions are my own. Coconut cake adapted from Shutterbean. A friend of mine comes to mind, because thinks of others before herself. Good luck with the bake sale and awesome giveaway! My gma is special because she is absolutely the most selfless woman I know! This. Cake. Can’t. Speak. Sentences. YUM. My mom is special because she fiercely loves her kiddos and would do anything for us (she also makes the best spaghetti sauce in all the land). My grandma learned how to take over the family business when my grandpa died — she’s 88 and going strong! First off beautiful cake! Second off, have fun at the bake sale, wish I could be there! Thirdly, of course I have to go with my Mom as my fave lady! She may not say what I want to hear all the time, but I still love her and depend on her for a lot! These days (my mother is gone) it’s all about my mother-in-law if the call goes out for some awesomeness. She’s al ways there for our family, cheerful, undaunted yet practical. What a wonder! My Mom is my favorite woman because she always listens to me. She will let me ramble on the phone about a problem for hours until I figure it out. She’s the best! I follow you in the twitterverse! I added EYHO to my Facebook faves! And I follow Fair Trade on twitter! My mother is one of the most awesome women I know. She always has allowed us to be who we are, which explains how all of the siblings are so different from one another. Her love for her family goes above and beyond. My mother is the kindest, most loving person I know. I love that you’re promoting fair trade products, lady…this is so important. What makes my mom (my favorite woman) special is her ability to sympathize with everyone. She always makes people feel welcome and never makes anyone feel small or unwanted. She’s the bommmmb! Coconut caaaaaaaaaaaaaaaake ugh your killing me! I love that you put coconut milk in the cake batter…this probably made it the moistest most delicious cake on the planet! I like Fair Trade Certified on Facebook…thanks for introducing me to them!! I follow Fair Trade Cert on Twitter yippyyyyy! Love the cake! 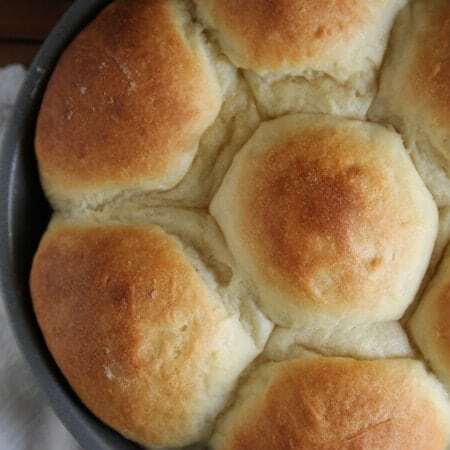 My grandmother was a baker and I know that’s why I bake. 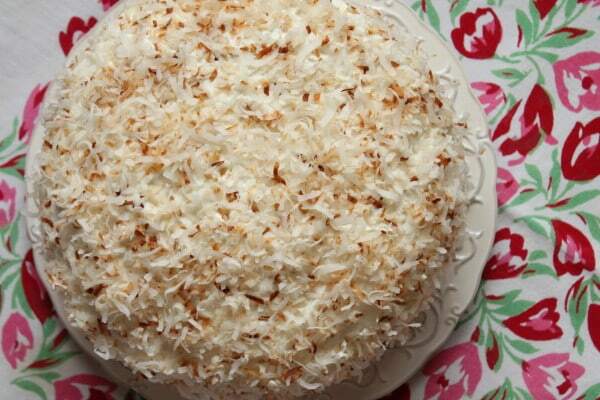 Love coconut cake and totally agree it has to have coconut throughout. I’ll have to try that filling the next time I make one. Yours looks amazing! I always knew that my mother was special but was overwhelmed listening to people some knew her whole life and some she had only met once during her calling hours. It was amazing to know that I had a chance to share my mother with so many other people and see how much she touched and inspired people. My mother — she is selfless and so strong. oh my this looks like heaven. LOVE coconut cake. This is a beautiful cake! I love coconut! If you’re interested in a box of fair trade products delivered to your door quarterly, check out Trade as One. It’s an easy way to make fair trade products part of your everyday life. My best friend is important to me because she understands and loves me no matter what ! Hi, I was just wondering how I would be able to convert this recipe into a cupcake recipe without completely mucking the whole thing up. I just need help with the conversions, I’m terrible at changing measurements! I’d like to make about a dozen cupcakes, and I’m not sure how the filling part is going to hold up in cupcakes. That batch made just shy of 2 dozen cupcakes, so you will probably want to halve the recipe. For those cupcakes I used a mango preserve for the filling, but you could still use this coconut filling. I would follow the same filling method that I use for those cupcakes (use a paring knife to take out the middle, then fill that little hole with your filling). You’ll probably need no more than half of the filling, maybe even a little less. 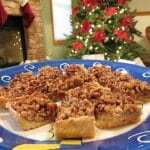 But my boyfriend and HIS family don’t seem averse to it, and so I’m going to try and bake these for them and hopefully impress! 😀 Thanks again! Hi Pam- If you’re going to make it far ahead of time (a day or night before), it might be good to keep it in the fridge just to be safe. Pull it out a solid hour before you need to serve, though, to let it take the chill off. I think that’s a great position to be in! Were you able to buy toasted coconut or did you make your own? 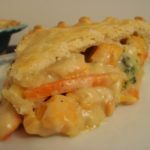 I had another recipe that used it and ended up making my own because I couldn’t find it anywhere? This cake sounds delicious. Coconut cake is my favorite! I just make my own! 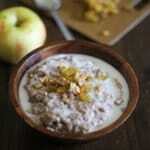 I toast it in a skillet over medium-low heat, stirring frequently, until it is nice and toasted. Hi! 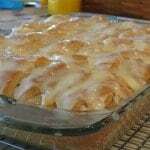 I just wanted to thank you for posting this recipe, I love coconut cake but they never turn out moist enough! This was delicious – I made a lime buttercream filling as my husband has a weakness for lime 🙂 and it went down a treat! Looking forward to trying out some of your other recipes too! We are not usually big cake people, but THIS looks amazing. I love how you are using coconut milk in the cake and that the flavor of the coconut is not just on the outside. My daughter is not a chocolate kid (ack!) and my son will eat any type of dessert – so this would be perfect for us!!! I am saving this because I think it has to be made. Stat. love this cake and what Fair Trade USA is doing! I am so making this! 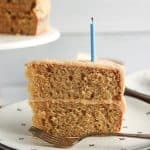 I pinned this to make for my husbands birthday …coconut is his favorite! I just made this coconut cake for the first time, and holy bananas it is amazing. 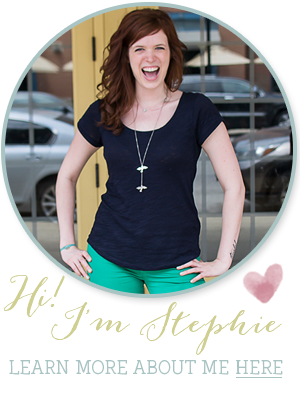 Thanks for all of the time you take to create these amazing recipes, Stephie! They are worth it every. single. time. Thank you!!! You’re the best. Hi. Can I half the recipe for a two layer 8″ cake? You could definitely try it. It might make the layers a bit thin, but would be worth a try.